Business investor Phil Wiegand answers that question! He shows, through personal anecdotes and solid biblical guidance, how an ordinary life can become an extraordinary adventure. Each of us, he writes, is given a “loaf” of time, and each new day shortens it by one slice. Will your “loaf” crumble into temporal meaninglessness or rise up with eternal value? 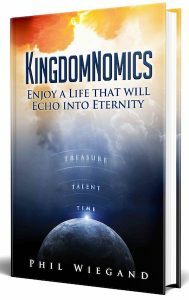 You’re making many investments in this life; the moments invested in reading Phil Wiegand’s book will bring dividends that will change the scope of eternity for you. 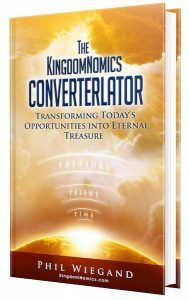 The KingdomNomics Converterlator, delves into the Biblical principles that clarify how we are actually agents of change in this world with rewards in heaven for all that we accomplish using those resources. Each day provides new opportunities for us to serve God by strategically using the resources he has entrusted to us. A Converterlator is an agent of change; a transformer who not only experiences a life of joy now, but who also makes decisions that will echo into eternity. A Converterlator sees the big picture, a picture that is bigger than just life here on earth. A Converterlator has a living relationship with God that makes an impact in our world and for eternity. The Bible is clear that we will experience rewards in heaven. As we use our time, talent, and treasure for God’s kingdom, we will experience a life of opportunity, impact, and legacy. Son Power is all about God generating the power for your impact on eternity. As a believer in Christ, you have Son power available to you. You have access to this power for supernatural living through the Holy Spirit. As Christ takes up residence in a believer’s life, he becomes a conduit for the empowering of the Holy Spirit. This power flows freely when you live a life that is in harmony with his revealed will. And because the Son’s power is eternal, it is this power that we vitally need to accomplish all that God has for us. We must avoid the mistake of trusting in our own limited power to accomplish God’s purposes and instead trust in the eternal power of the Holy Spirit. When we allow Son Power to work in and through us, our lives, desires, and accomplishments will be transformed. 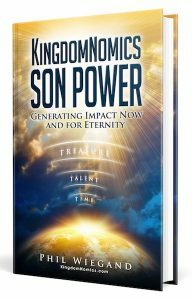 Son Power affects our lives now and creates a lasting impact that stretches into eternity.